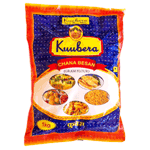 Gram flour is a pulse flour made from ground chickpeas or chana dahl. It is also known as chickpea flour, garbanzo flour, or besan. Product of India.